The Skinny: A bravura directorial effort from Johnnie To that gets mired beneath crossed thematic goals, questionable writing, and possible miscasting. However, as a ninety-minute cinematic freight train, Breaking News proves to be an entertaning, sometimes slyly funny action thriller. The fact that Johnnie To's latest film Breaking News got an invite to the Cannes Film Festival should tell you something about the director's international reputation. Basically, that reputation exists, but it's also inexorably tied to the crime genre. Films like Love For All Seasons and even the award-winning Running on Karma don't usually get international fans salivating, and this even goes for the Hong Kong Cinema-faithful who'll watch everything that To directs - and who probably gnash their teeth over the latest Johnnie To-Sammi Cheng romantic laffer. All those lingering fears of Johnnie To-lite should be put to rest with Breaking News, an entertaining crime thriller with a few interesting satirical nods. Still, the cast is a bit surprising: popstars Richie Ren and Kelly Chen, and usual funnyman Nick Cheung (!) play the suave cop/criminal types in this film. Was Lau Ching-Wan busy? Richie Ren is Yuan, a cool Mainland professional thief who sets the Hong Kong streets on fire in the film's first eight minutes - an amazing steadicam sequence that details the beginning of a pitched gunplay battle and its subsequent fallout in a single take. On Yuan's tail is Inspector Cheung (Nick Cheung), a slightly goofy-looking version of the standard "Cop Who Breaks All the Rules". The cops' stakeout goes bust, leading to a firefight and finally a media-covered sequence of an average beat cop actually raising his hands and surrendering to Yuan and his three comrades. The televised display of cop cowardice sets the public against the police, a sentiment furthered by the fact that Yuan and his gang gets away. The Royal Hong Kong Police Force have likely never had a poorer Q-rating. Enter Inspector Rebecca Fong (Kelly Chen), who suggests to her superior officers (including Simon Yam in a cameo) that the cops regain face by putting on a "big show". That show will include unprecedented media access to the apprehending of Yuan's gang - once they catch up with them. Fong has her crew scouring the streets for info, which leads them to Yuan's apartment building hideout at nearly the same time as Cheung and his team, who brazenly disobey orders by staying on the case and invading the building. Once Fong gets wind that the planned primetime bust is going down, she assembles the cops and media for her big show, and begins to orchestrate events to make the cops seem like the heroes they're supposed to be. Meanwhile, Yuan catches on to the media manipulation, and starts finding ways to debunk the cops' media spinning. All the while, Cheung stays in the building, and strengthens his personal resolve to bring down Yuan. Breaking News charges forward like a barrelling freight train, which can be credited to Johnnie To's solid direction, as well as his unparalleled ability to work minor quirks into otherwise generic crime films. Inspector Cheung may be a hard-nosed cop cliché, but his interaction with the frustrated Fong, who wants him off the streets pronto, and his sometimes dopey subordinates (including To regular Hui Siu-Hung as a flatulent cop) is handled efficiently and entertainingly. Similarly, Yuan is revealed to be a suave, honorable thief who frowns on killing kids, and has the charisma to defuse tensions between his gang and the men belonging to Chun (Yao Yong), a Mainland hitman who happens to be caught in the building too. Yuan takes hostages (Lam Suet and his two kids), but treats them extraordinarily well, even cooking dinner for them and delivering footage of their meal to the media to show up the cops. The satirical element of Breaking News offers some rich ground to cover. The cops are trying to put on a show, but their media machinations are countered by Yuan's intelligence and gamesmanship. Yuan is portrayed as a smart guy who puts his principles first, and is perhaps better at handling the media than the cops are. Indeed, he would probably get away with the whole shebang if it weren't for Cheung's Rambo cop ingenuity, or some minor happenstance involving the ultra-photogenic Inspector Fong, who's seemingly admired by every male cop (and even male thief) within 100 yards of her. Yeah, even though this is a tough thriller/media satire combo, it's all too apparent that there are screenwriters at work. The pointed media satire provides some good narrative fodder, but there are more obvious screenwriting conceits - like the forced attraction between Yuan and Inspector Fong - that seem like remnants of a marketing meeting. There's also a weird male bonding subplot that goes to an illogical extreme, and seems to exist only to end the film on a self-referential note. Odd existentialism in Hong Kong crime films is nothing new, but their presence in Breaking News only seems to weigh the otherwise sleek narrative down. Screenwriters Chan Hing-Kai, Yip Tin-Shing, and the Milkyway Creative Team (Woohoo! Screenwriting by committee!) spend too much time crossing their thematic wires, and the result is not a film that really seems to say much. The media satire is there, but not fully played out. The male bonding, and existential thoughts of professional criminals are explored, but the ultimate payoff seems forced. And the attraction between Yuan and Fong is too undeveloped and uninteresting to be anything other than movie screenwriting. Also problematic is the film's casting, which is totally odd for a Johnnie To film. Richie Ren gets the Andy Lau role, and is sufficiently charming and even charismatic as the intelligent thief Yuan. What he doesn't seem to possess is the requisite edge of a killer, which Yuan plainly is from minute one of the film. Nick Cheung fares slightly better as the hard-boiled Cheung, if only because he's not really required to carry the film. 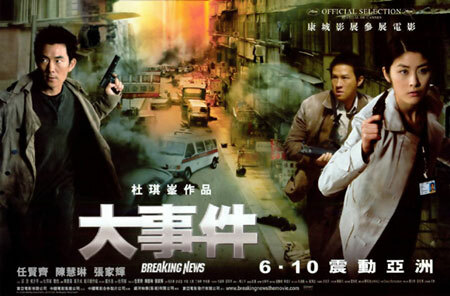 Cheung is suitably intense for a light media satire/action thriller like Breaking News, though he would still be all wrong for either the Lau Ching-Wan or Andy Lau roles in Running Out of Time. On the lower end of things is Kelly Chen, who no matter how you slice it, does not look or act like she belongs in this film. Inspector Fong's intensity and intelligence aren't adequately conveyed by Chen, nor does there seem to be much lingering beneath Fong's gorgeous exterior. At the very least, Chen's icy screen persona seems fitting for her character, but that doesn't really make her seem interesting.